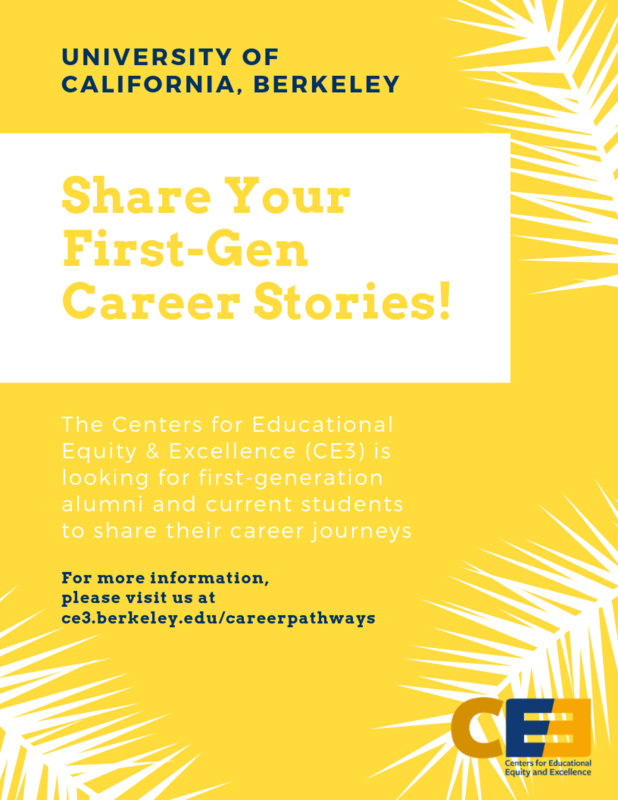 The Centers for Educational Equity & Excellence (CE3) at UC Berkeley aims to gather the beautiful stories from those of us who were the first in our family to graduate from college. We hope to celebrate and uplift these narratives and provide students who are in the early stages of their journey a guiding path to strive towards. For many of our communities, stories and the act of storytelling are how we learn and gain wisdom from those who have come before us and our elders. Therefore, we appreciate your interest in taking part of this mission and sharing your story with us! There are several ways you can get involved! Video Interview: take part in an on-camera interview in which our wonderful team will guide you in sharing your journey into, through, and after your time in UC Berkeley. Share with us the ways you navigated Cal and how that has led you to your professional career today as well as your dreams for your future. We also invite you to take us through your day-to-day (classroom, workspaces, home, etc.) to fully capture your story! These short video narratives will be shared on our website and through our other outreach efforts. Offer a Written Biography: provide a short biography regarding your journey as a first-generation and/or low-income student and describe how that has guided you to your current career(s). Please refer to the sections on this form as a guide and breakdown for your bio. Connect with Students 1-1: be an additional resource for students interested in your career field through 1-1 informational interviews, Q&A panels, or guided mentorship. Visit this page to sign-up! Thank you once again for joining us in our efforts, we appreciate you! For questions, please do not hesitate to contact our program coordinator, JC Bautista at jcbautista@berkeley.edu.